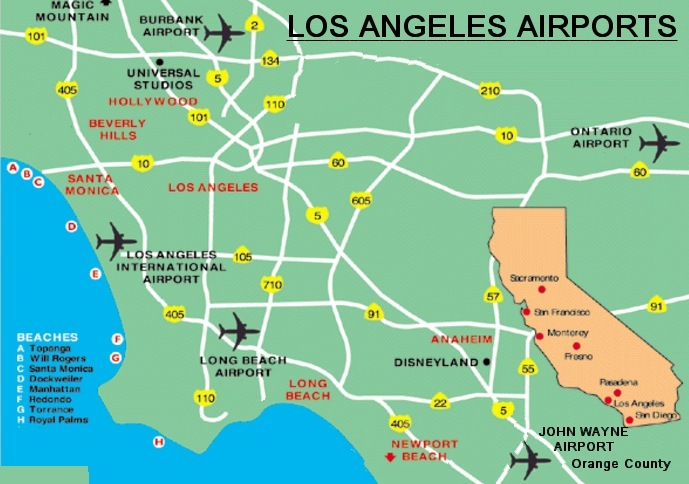 Which Los Angeles Area Airport Should I Fly Into? Ah, Los Angeles! Land of fame and fortune. But, despite how easy the tanned, jet-setting celebrities make it look, you need a lot more than a dream and a cardigan to navigate this southern California city’s many airports. 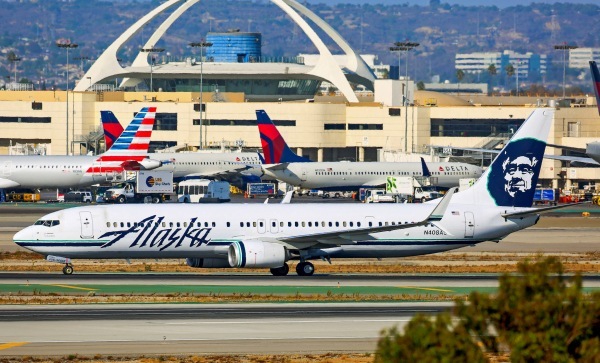 True, the addition of sunshine and balmy temperatures make any initial landing pleasant, but in terms of getting out to to the glamor of Rodeo Drive or the funky, free-spirited boardwalk of Venice Beach, you’ll want to be strategic with which airport you fly into. And while we wish there was some secret, celebrity-only airport that let you avoid the 405, the truth of the matter is your travel plans should budget a healthy amount of time for bumper-to-bumper traffic and angry Angelenos. The best you can do is plan ahead and pick an airport that’s most convenient to your final destination. Located in: Westchester, which is, helpfully, west of downtown Los Angeles. Choose it if: You want to be anywhere near haute hotspots like Beverly Hills, Santa Monica, Hollywood or Malibu, or kid-friendly finds like Disneyland. Think again if: The idea of billion-dollar renovations, traffic jams and frantic sprinting to make a connection gives you hives. Worst thing about airport: Despite its size — or, actually, because of it — LAX is consistently ranked one of the worst airports in the US because of long waits through security and immigration. Unsurprisingly, it’s also one of the busiest, serving 40.5 million in 2016 alone. Best thing about airport: If you’re lucky enough to be flying through the Tom Bradley International Terminal, you can expect a luxury shopping and dining experience, with La La Land faves like Petrossian, Chaya, and ink.sack steps away. Also, a helpful (and sometimes adorable) Twitter feed keeps fliers informed and entertained through delays. Distance to Hollywood: You’ll be around 25 miles away, which, in good traffic means about 40 minutes on the 405 and around $35. But be warned — L.A.’s traffic is notorious for a reason. Located in: San Bernardino County, to the east of L.A. Choose it if: Your itinerary is taking you to San Bernardino, its attendant National Forest, or you got a killer fare here. Think again if: You’re relying on anything but a car rental for transportation. Worst thing about airport: It might cause turmoil for travelers hoping to go to Ontario, Canada, and not paying close enough attention. Best thing about airport: With a smaller, #nofilter vibe, you get what you pay for. Distance to Hollywood: 46 miles, an hour, and a hell of a time trying to find an Uber (you’re better off with a good, old-fashioned yellow cab). Choose it if: You’re headed to places like Costa Mesa, Irvine and Newport Beach, and are looking for an airport that won’t overwhelm. Think again if: You’re looking for a late flight. Nearby neighborhood noise restrictions shut down flight schedules early. Worst thing about airport: It’s in Orange County. Also, if you’re looking to fly internationally, your options are pretty much limited to Mexico and Canada. Best thing about airport: It’s in Orange County and convenient for many travelers living south of Los Angeles. Distance from Hollywood: 44 miles, an hour — or more — with traffic. Located in: Burbank, close to many film and TV studio sets. Choose it if: You’re a film buff and enjoy well-placed Hollywood memorabilia while you’re sprinting to your gate (fun fact: the last scene of “Casablanca” was filmed here!) or you can’t deal with the swarming masses at LAX. Think again if: Your final destination is Long Beach or Disneyland. Worst thing about airport: The food situation is a bit grim, with only a few overpriced options; also, the branding on the airport (is it Bob Hope? Burbank? Make up your mind!). Best thing about airport: Limited flights mean shorter and — dare we say — more pleasant encounters through security and less of a hustle to your gate. Distance to Hollywood: A mere 10 miles and about 20 minutes will take you south on the 101 towards the Walk of Fame. Located in: Long Beach, California. Choose it if: You want to experience flying in the golden age of short lines, cheerful staff, and edible, mostly affordable airport food. This is the way many Angelenos fly, if they can help it. Think again if: You want to get out of the country — LGB has only four carriers (American, Delta, Southwest, and JetBlue), and all of them domestic. Still, you can fly direct to anywhere from New York City to Anchorage, Alaska. Worst thing about airport: Dare we say, it’s too perfect, right down to its charmingly earnest Twitter feed? Best thing about airport: Most fliers say you can arrive a mere hour before your flight and get through security with a smile still on your face. Distance to Hollywood: Approximately 31 miles and a lot of traffic.